The Pros and Cons of Long Term Care Insurance Group Plans. Are they a good deal? Many of our visitors begin researching Long Term Care Insurance group plans when offered at work. We’ve designed this page to cater just to you and to explain in brief why Long Term Care insurance group plans may be a bad deal for you and you can save money using your good health to your advantage by having yourself individually underwritten. If you are in good health, individual policies are worth a look, according to an article in the Wall Street Journal. Let’s look further. There are a few major group plans on the market that consumers are faced with comparing. As a free service to our visitors, we will compare benefits on your proposals with what is available on the private Long Term Care insurance market. You can fax your benefit sheet to us or we can do it by phone (this free service is available by calling 1-800-800-6139) to provide comparisons on similar policies. The Federal plan was originally administered by MetLife and John Hancock. Both companies are well known and offer individual policies with couples’ discounts and available health discounts. As of January 1st, 2010, the plan was switched to be just underwritten exclusively by John Hancock. The problem: rates will be 25% higher with the new plan. Federal employees are none too happy about this based on forum posts. Why did Fed LTC rates go up 25% ??? Many reasons have been discussed, but to veteran agents, it is because these plans were underpriced to start with, especially considering that initially even unhealthy people could join the plan whereas inidividual policies would have been out of reach. There are many group options but the more popular options are offered by John Hancock, Mass Mutual, Genworth, Mutual of Omaha, Transamerica, and New York Life. Many of the group plans will offer a discount, but at the same time the benefits are often limited on key options like inflation protection (you’ll most likely want 5% Compound or 3% Compound) and home health care (you’ll probably want 100% coverage since this is the most popular option. The reason is during open enrollment periods with group plans the insurance company is letting all health types such as people with diabetes, cancer, smokers, etc. into the group. Those higher risk people are a greater risk to the insurance company so they charge everyone more, including the healthy. It’s just like buying an Auto Insurance policy and having a perfect driving record, and then being grouped into the same class as the folks who have DUI’s, speeding tickets and 16 year old boys drivers. For example, in the Federal Long Term Care Insurance group Government’s of employees, you have people who are very healthy and some who are not so healthy. The insurance company must charge more in premium and provide less in benefits because they are more liberal in their underwriting (this means health screening.) As we mentioned before, the first benefit these long term care insurance group plans love to cut is Home Health Care, which is the portion of a long term care policy you’re more likely to use. It’s very common for the group long term care insurance plans to cut the Home Health Care Benefit by 25% – and sometimes up to 50%. In effect, they are penalizing you for using your policy for the most comfortable type of care: care at home. 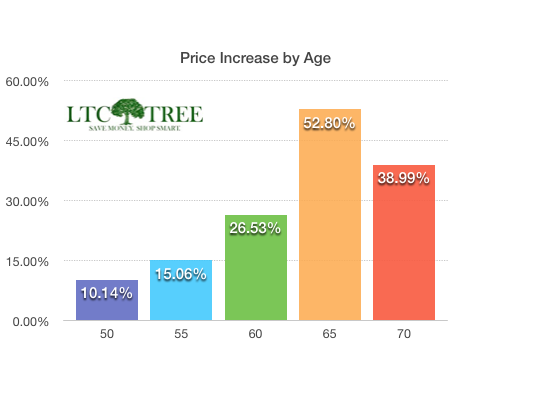 LTC Tree’s analytics department did a November 2014 study comparing the largest group Long Term Care Insurance company offered to a major state university in Michigan and found the raw data showing at every age bracket a healthy person can get more benefits for much less premiums by buying an individual long term care insurance policy vs. a group plan. Here is some simple math to show the out of pocket monetary risk in buying a long term care insurance group plans. Assume your group LTC policy pays 75% home health care and your policy benefits have grown to $600 per day (with inflation protection, this is possible in the future). Next, assume that you need to file a home health care claim because you broke your hip and want to recover in your own home where you feel most comfortable. If your group plan pays ONLY 75% home health care you will have to pay 25% (or $150 per day) out of pocket simply because your group long term care insurance does not cover 100%. Taking this to its logical conclusion, $150 times 365 days in a year is $54,750 out of pocket because you had a limited LTC group policy. You can double the cost if your group long term care insurance policy covers only 50% for home health care. On a fixed income, how great is your group long term care policy now? Beware of Group Long Term Care Insurance Discounts: Spousal Discounts can be larger. Another disadvantage of many group long term care insurance plans is the lack of spousal or partner discounts. With individual policies, you can purchase coverage for both husband and wife (or partners) and get up to 40% discounts. And getting coverage for both partners makes sense for most families. The idea with LTC is to limit risk, so having both spouses covered, especially with such a rich discount, can be quite affordable. In Summary, with individual policies you can go with the exact same companies that sell the group long term care insurance. What’s better is that you’ll get a policy that is less expensive and provides more benefits (like 100% home health care) simply by submitting to the company the right to evaluate your medical history. AND, you will be in a risk pool that has been much more screened than a group… this means more stable rates over time. The only time it is wise to buy group long term care insurance is when a person has major health problems and can not qualify for an individual policy. If you are unsure of your insurability, give us a quick call or fill in the form below. Do yourself and your wallet a favor by comparing your long term care insurance group plan policy with and individual long term care policy. We work with all of the large companies that write group long term care insurance. The difference is, we will show you the less expensive side in the individual and couples market. You can rest assured that – in the end – you will have more benefits for less money. Get your individual Long Term Care Insurance group plan quotes today by filling out your request below.